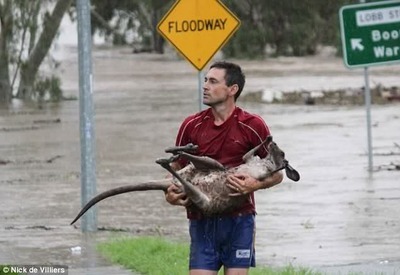 An Ipswich man named Raymond Cole has shot to fame in Australia after pictures were released of him braving floodwaters in Ipswich Queensland to rescue a joey (baby) kangaroo from the floods near his home. Raymond says he was with about 50 other people, watching the flooded Bremer River when they spotted the joey struggling in the water. People called to police and SES workers to do something, but the police deemed it too unsafe to go into the water to save the animal. Cole ignored warnings from the police and waded into the water to get to the joey which had become wedged in debris. Cole managed to get hold of the kangaroo, receiving a kick to his face in the process and dragged it onto a log, but the water wasn’t the only problem. A large spider had taken refuge on the log and Cole had to scare it away. Cole said he’d been raised with the idea that you reach out and help others and that was why he decided to rescue the kangaroo. The last that he saw of it, it was being cared for by some people who had wrapped it in a blanket and it was back on its feet. This entry was posted in Australia and tagged Australia, Bremer River, Flood, Ipswich, Kangaroo, Queensland, raymond cole. Bookmark the permalink.